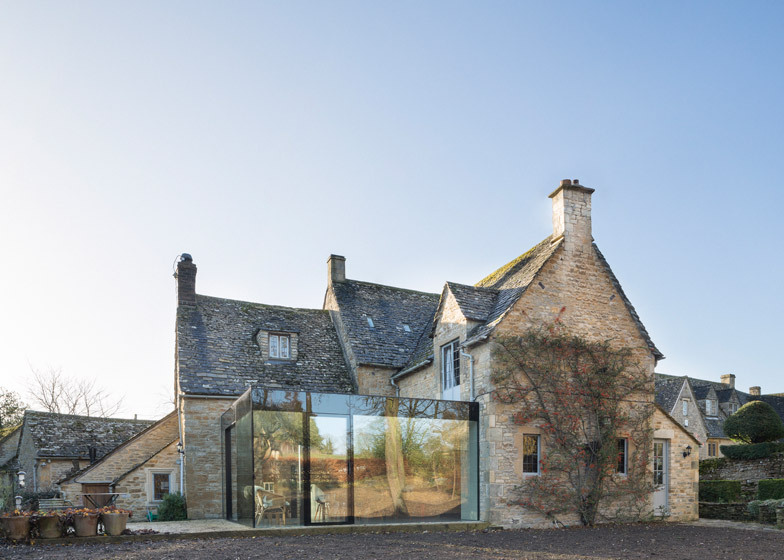 Eastabrook Architects and London studio Jonathan Tuckey Design has added a contemporary glazed extension to a Grade II-listed Cotswolds house to provide additional space without detracting from the original building (+ slideshow). 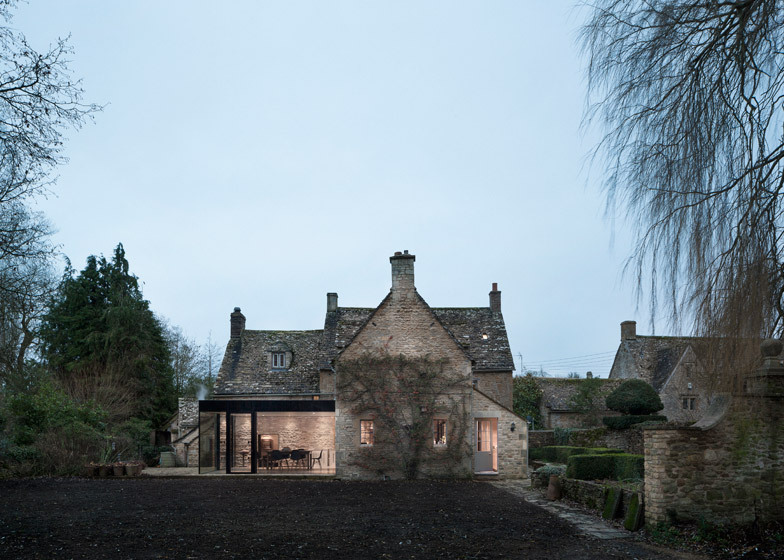 The owners of Yew Tree House previously had a small kitchen with little dining space, so they asked Gloucestershire firm Eastabrook Architects and Jonathan Tuckey Design to create a contemporary open-plan extension that remained respectful to the early 17th-century building. Eastabrook carried out the original concept and planning and oversaw work on site, with Jonathan Tuckey appointed to work in collaboration on the detail design. "We wanted the extension to be 'a space in between' the garden and the original house," architect Ryuta Hirayama told Dezeen. 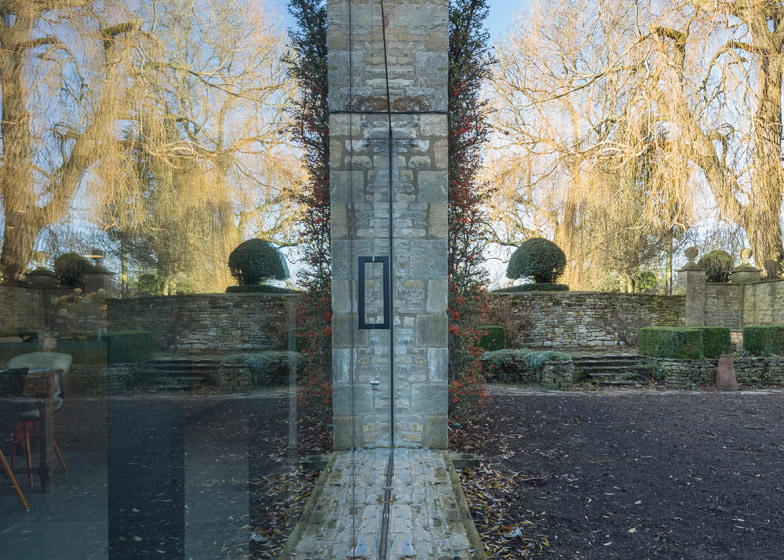 "In the day, the glass reflects the garden, and appears to almost melt into it, and at night the extension illuminates the stone wall and the glass facade almost disappears." The north-facing extension replaces a series of additions at the back of the house. 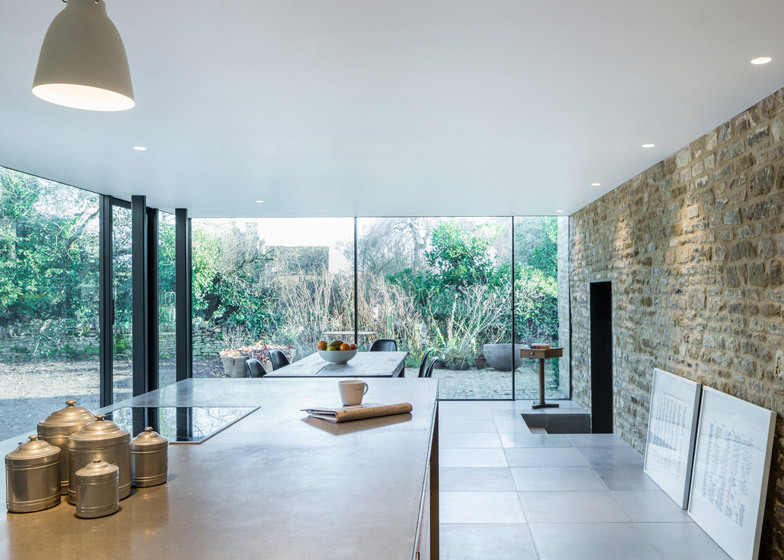 Jonathan Tuckey Design – whose previous projects include an extension with a latticed wooden ceiling and a renovated London mews house, conceived the design – specified a mixture of contemporary materials to contrast with the stone of the original house. A lightweight single-ply roof was used to minimise the need for bulky support columns, while a stone wall has been left exposed inside to lessen the extension's impact on the original building. "The extension has been designed as a lightweight structure, which touches the existing house very lightly," explained Hirayama. The stone wall extends outside, visually connecting the indoor and outdoor spaces, and stone from a demolished wall has been reused as paving for the patio. Two doors from the existing house, which originally led outside, now provide access to the extension. Both have been lined with black steel to match the black aluminium and steel used for the window frames and support columns in the extension. One of the doorways also lines up with a glass door in the extension that leads outside, to create an easy flow between the house and the garden. "Our intention was to make the existing openings like gates to travel from the old house to the new extension, and on to the garden, creating both visual and psychological connections," said Hirayama. A blackened steel surround around the extension's exterior door also supports the roof and conceals rainwater downpipes. 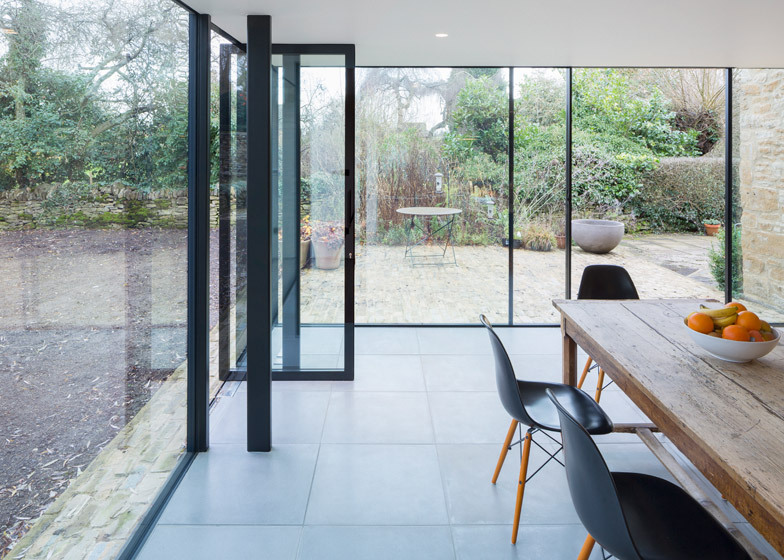 Thin-framed sliding doors along one of the extension's walls provide additional access outside to the patio, allowing the owners to open the home up in the summer. Pre-cast concrete has been used for the floor tiles inside, and also for the kitchen island in order to simplify the material palette and not detract from the original house. "The client wanted the extension to be contemporary, and feel different from the existing house," said Hirayama. "Pre-cast concrete was chosen because it has a similar mineral quality to the stone, but it is engineered and measured in the same way as the new glazed structure."